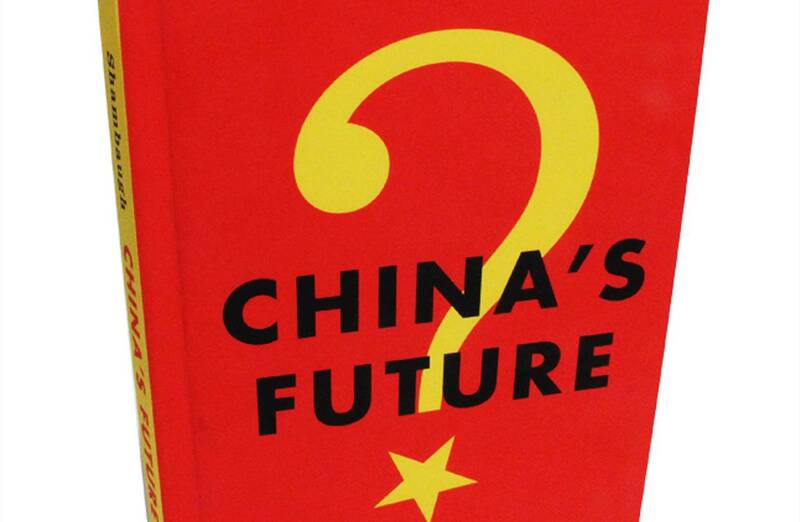 Home » Manifesto of China’s Reformers: David Shambaugh’s China’s Future? A review of China’s Future? David Shambaugh, London: Polity Press, 2016. A leading U.S. authority on China’s politics, David Shambaugh of George Washington University, has authored what amounts to a manifesto of China’s reformers who are dismayed by the recent return to hard authoritarianism under President Xi Jinping. These moderates believe that the current retreat from both deeper marketization of the economy and gradual political liberalization and return to hard-line repression not seen since the immediate aftermath of the Beijing massacre of June 4, 1989, will ultimately undermine rather than strengthen Communist Party rule over China. China’s reformers cannot themselves write an open and direct critique of China’s current direction under Xi, so Dr. Shambaugh has given them voice. In effect, China’s reformers have aired their views through a well-connected American Sinologist. 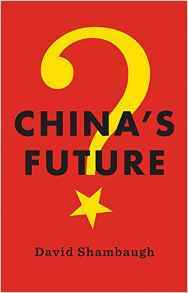 Anyone desiring to understand the debate over China’s future underway among China’s top leadership can do no better than Shambaugh’s concise book. (172 pages exclusive of notes). The upheaval that began with the autonomous student movement in Beijing in April 1989 continued through the collapse, one-after-the-other, of the East European Communist states and culminated in the disintegration of the USSR at the end of 1991. It was a profound shock for China’s rulers, a near-death experience. A consensus quickly emerged within the CCP top leadership. The decision to impose the Party’s will in June 1989 had been “correct.” Political liberalization allows opposition to emerge and leads to mounting challenges to Party leadership that may require highly risky confrontation with large and mobilized sections of the population. This was the fundamental “lesson” of the 1989-1991 upheavals. Don’t relax or lose control. Don’t allow opposition to emerge and coalesce. Insist on upholding Party leadership. Don’t share power. This is the perspective that inspires the current return to hard-line authoritarianism under Xi Jinping. By the mid-1990s, however, and according to Shambaugh, a different interpretation of the “lesson” of the Soviet collapse emerged among CCP leaders. From this perspective, the fundamental cause of the Soviet collapse was not Gorbachev’s much-belated efforts at reform starting in the mid-1980s, but the increasing bureaucratization and rigidity of Communist rule, plus a disregard for the desires of the people of the Soviet Union going back to the 1920s and 1930s. These things, this ossification of Communist rule, had made Gorbachev’s desperate efforts necessary. The overthrow of Soviet Communist rule in 1991 was the result of six decades of repression and stagnation. This was the great danger the CCP needed to avoid. The Party needed to forge a more “consultative” type of rule with a more independent media, legislature, judiciary, economic activity, and civil society. The Party needed to pay greater heed to the desires of the people, and less attention to imposing its will. The Party needed to give up a degree of control – to the judiciary, to legislative bodies, the media, the intelligentsia, to enterprises. Changes along these lines, the reformers argued, ultimately would strengthen CCP rule. Refusal to become more inclusive was the path to ultimate regime demise. From 1998 to 2008 the moderate reformers’ views prevailed, and under the tutelage of Jiang Zemin and Hu Jintao, China followed a “soft authoritarianism” course. Autonomous civil society organizations were tolerated. The media were given freer rein. People’s Congresses and the “democratic parties” were given a broader role in “consultation.” Private entrepreneurs were subsumed within the realm of “socialism” and given political voice. Foreign entities operating in China were given loose rein. Late in 2008, however, a conservative coalition coalesced around deep suspicious about the previous decade of soft authoritarianism and progressive weakening of Party control. This coalition included the Party propaganda apparatus, ministries of state and public security, the People’s Liberation Army and the People’s Armed Police, and inefficient state-owned enterprises. Party control was reinstituted across a range of policies, turning China away from soft to hard authoritarianism under Xi Jinping. The crux of Shambaugh’s argument – and, I believe, that of the CCP moderates he is speaking for – is that China now faces a series of very serious problems which cannot be adequately addressed under hard-line authoritarian policies inspired by fear of CCP loss of control. Rather, genuine solutions of these problems will require loosening of Party control over the allocation of capital and labor, higher education and intellectual inquiry generally, civil society, and even institutions of state and the political process to a significant degree. CCP moderates do not envision liberal democracy for China. Their inspiration is Singapore, where a single party perpetuates its rule but with autonomous technocratic organs of government (including legal and judicial organs), and wide if still limited scope for free debate and discussion. Shambaugh piles up a long list of pressing problems: An aging population and exhaustion of low-cost labor supply. Future costs of caring for the elderly. Property and stock market bubbles. Huge levels of debt carried by local governments and state owned enterprises. A heavy burden of non-performing loans carried by banks. Massive over-building of industrial plants. Sub-optimal allocation of capital via state fiat to state-owned banks. Informal loans provided by non-official lenders that are largely unregulated, very important for the private sector and, thus highly risky. Degradation of arable land and usable water. Air pollution. Normalizing the status of China’s vast population of migrants illegally inhabiting its cities. Meeting the rising expectations of an ever-larger middle class deeply plugged into global events (including uprisings against autocratic regimes around the world) via the internet. Maintaining positive relations with the United States and with China’s neighbors. Adequate solutions to these problems will require a greater openness and a greater role for markets – with a corresponding rollback of state control. China’s leaders generally understand this, Shambaugh argues, and have laid out policies to address these problems in authoritative statements of previous Central Committee Plenums. Yet those earlier policy prescriptions have been ignored. Fearing loss of control and dominated by the conservative coalition, CCP leaders have drawn back from real reform, relying instead on administrative control and repression. This, Shambaugh maintains, is the CCP path to Soviet-style stagnation, bureaucratic ossification, and popular alienation. Two key and interrelated threads of Shambaugh’s argument have to do with: 1) escaping the middle-income trap by shifting to high value-added production, and 2) the role of free intellectual inquiry in fostering scientific and technological innovation. A middle-income trap occurs when a newly industrializing country succeeds in becoming a producer of low-cost, labor-intensive export goods utilizing brands, product designs and production technology supplied by richer, more technologically advanced countries. On this basis, the country accomplishes a comfortable mid-range of income and development. It fails, however, to move past this stage of development and become a rich country or leading global economy. China’s leaders recognize this danger. A State Council investigation found that only 13 of 101 industrializing economies had succeeded in escaping this “trap” and becoming rich economies. “Successes” included Japan, South Korea, Taiwan, Hong Kong, Singapore, Israel, Puerto Rico, and Mauritius. Economies that remained “trapped” included Russia and other post-Soviet states. To escape the mid-level income trap, China needs to shift from massive investment in fixed assets (transportation infrastructure, housing, and expansion of heavy industrial facilities) and production of goods for export to production of goods and services for Chinese consumers. Massive state spending and easy bank loans under state guidance drives China’s current “middle income” production structure. China’s most efficient, dynamic, and innovative firms tend to be private companies outside the state sector and disesteemed by China’s formal financial system. China’s leaders understand, Shambaugh says, that deep market reforms are necessary if China is to escape the “middle-income trap” and become a rich and leading economy. But confronted by a slowdown in China’s economic growth rate combined with sluggish foreign demand for China’s exports, China’s conservative control-minded leaders, fearing loss of control, have fallen back on an old tried and proven method of state fiat and administrative direction. In terms of free intellectual inquiry, Shambaugh’s argument is that such freedom is required for path-breaking scientific and technological innovation that leads to new products and processes that become embedded in high value-added goods and services. Indigenous innovation is thus a key driver of escape from the middle-income trap. China’s leaders clearly recognize this problem and have spent significant money on research and development and on elite universities. China now produces an abundance of journal articles and files a large number of patents. It woos accomplished ethnic Chinese engineers and scientists to “return” from Europe and the U.S. to China to continue their investigations. Yet the payoff of these efforts in terms of basic innovation has been paltry. Shambaugh attributes this to a Confucian emphasis on rote memorization and a preference (once again) for state direction and control. Major breakthroughs in understanding – new ways of looking at things – are difficult to accomplish in an atmosphere of insistence on ideological correctness and orthodoxy. Creating a genuine innovation economy and thus escaping the middle-income trap will require that China embrace a culture of free intellectual inquiry and debate, Shambaugh argues. Shambaugh outlines several possible trajectories for the CCP. The good outcome, he suggests, would be a return to power of a reform coalition at the next Party Congress in 2017. China’s post-Mao politics has been characterized, Shambaugh notes, by a shift every several years between a period of “fang” or relaxation, followed by several years of “shou” or tightening. The current post-2008 tightening may be merely the most recent iteration of this fang-shou cycle, to be followed by renewed efforts at reform – perhaps after the global economy has escaped its current doldrums. Shambaugh also raises the possibility that strongman Xi Jinping might be pushed aside at the 2017 Party Congress, or perhaps even before that, in some sort of intra-Party coup. On the other hand, if the current conservative hard authoritarianism continues, the CCP state might be sliding into its “Brezhnev period” of several decades of bureaucratic ossification and alienation from those it rules. In such a situation, Shambaugh suggests, CCP leaders might attempt to re-legitimize their rule by giving the Chinese people what they crave: demonstrable establishment of China as a leading – perhaps “the” leading – global power. Hard authoritarianism internally combined with aggrieved nationalism externally would be a gloomy development. next post: China Rules the World?